A ‘unique’ bottle of 60-year-old Macallan, hand-painted by Irish artist Michael Dillon, has today (29 November) become the world’s first million-pound whisky sold at auction. The single bottle of Macallan 1926, bottled at 60 years old, was auctioned by Christie’s in London for a total of £1.2m (US$1,528,800/€1,352,400), including buyer’s premium, smashing the previous record of £848,750, set by another bottle of 60-year-old Macallan in October this year. 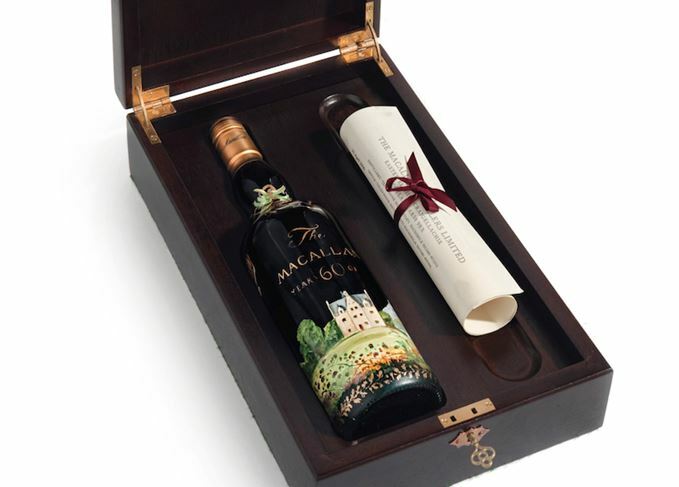 The bottle, which features a depiction of Easter Elchies House, Macallan’s spiritual home, was first offered for sale by Fortnum & Mason in 1999, but even the distillery itself was unaware of its continued existence until it was offered at auction. The bottle was drawn from the same cask – number 263, filled in 1926 – that yielded two sets of 12 bottles with labels designed by pop artists Sir Peter Blake and Valerio Adami. It was an Adami bottle that held the previous world record, set in October during a Bonhams auction in Edinburgh, and a number of Blake and Adami bottles have been sold this year, regularly fetching record prices. Today’s Christie’s auction featured the largest sale of rare spirits yet staged by the auction house, also including a bottle of Macallan Lalique 50 Year Old, which doubled its pre-sale estimate to sell for £144,000. Meanwhile, a bottle of 1919 Springbank fetched £132,000 (pre-sale estimate £100,000-150,000), but a bottle of Yamazaki 50-Year-Old First Edition fell short of expectations, selling for £144,000 (estimate £150,000-200,000), some way below its own record of £212,358, set in Hong Kong earlier this year. Five bottles of Macallan Genesis, a £495 limited edition whisky which sparked traffic chaos outside the new Macallan distillery when it was released in August, fetched £2,280 each at today’s auction, with the proceeds going to selected Speyside community organisations. Investigating the history of the 1926 single malts that sold for US$1m-plus at auction.